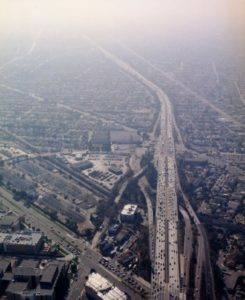 Benny Chan has worked diligently over the past few years to photograph overhead views of Los Angeles freeways during the height of rush hour. Using a camera designed and manufactured exclusively for this project, Chan has taken pictures from high in the sky from a helicopter and has rendered monumental sized prints. With his almost omniscient perspective, Mr. Chan explores and sheds light on the conundrum of traffic as a symptom of a society being unable to keep pace with its own expansion, while at the same time rendering a serene beauty from the chaotic scene.